Take a detour from your day to day and experience something new in Butler County, Ohio! Butler County is home to beautifully diverse streetscapes, the Donut Trail, unique attractions for all ages, delicious international dining spots, miles of hiking trails, and so much more. See for yourself what makes our corner of Southwest Ohio so special. Conveniently located between Cincinnati & Dayton, Butler County is an accessible weekend getaway destination with world-renowned adventure spots like Jungle Jim’s International Market, The Donut Trail, Wake Nation, EnterTRAINment Junction, and Pyramid Hill Sculpture Park & Museum. Explore & discover our lively and eclectic communities, we hope to see you soon! Fairfield is a foodie traveler’s dream come true. Jungle Jim’s International Market draws visitors from all over the world with 6 acres worth of global delicacies. Local restaurants feature the flavors of India, Jamaica, Nepal, and more. 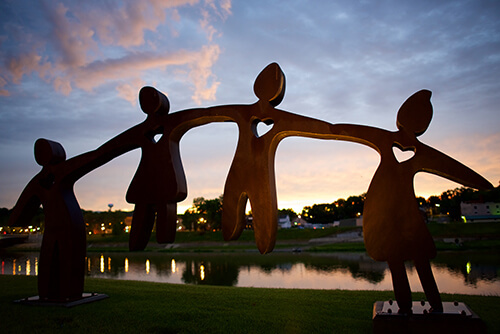 The City of Sculpture is alive with vibrant art and history. Take a stroll through their charming streetscapes. Murals adorn downtown walls, breweries buzz with award-winning brews, and sculpture parks wait to be explored. Middletown is rich with local history, a thriving foodie scene, and fosters a creative environment for makers of all kinds. Learn how to make glass art at the Haute Fusion Studio and grab a bite to eat at the chef-driven culinary hub, Gracie’s Restaurant. West Chester is packed with all kinds of family-friendly attractions. Take a swing at Topgolf or challenge yourself with the high ropes course at Main Event Entertainment. Find amazing pieces for your home at IKEA or the Frontgate Outlet. Known as one of the best college towns in America, Oxford’s cobblestone streets and adorable downtown make it an opportune destination for midday adventures. Catch a Miami University hockey game and before you go, grab a beyond delicious bagel sandwich from Bagel & Deli. Take a break from your daily hustle and recharge in these quaint, historic towns. Lush green landscapes greet you during your drive in and incredible places like the Salty Dog Museum are ready for discovery. Dynamic and always growing, Liberty Township has amazing attractions like Liberty Center and The WEB Extreme Entertainment. Whether you’re looking for dinner and a movie, premiere shopping, a comedy show, or a local candy shop, you can find it in Liberty Township. Monroe bustles with shopping and local dining while still maintaining that requited small-town feel. Enjoy a meal at the Fantasy Diner & Ice Cream Parlor and a round of the local flavor at Rivertown Brewery & Barrel House. Take a tour of Trenton and experience all of the farm market charm at Barn-N-Bunk. Gigantic silos graze the sky and locally grown produce, baked breads, cheese & jellies, and local honey are always on hand. Nestled between Hamilton and Oxford, Hanover Township is a beautiful, natural retreat into the country. Featuring the incredible Hanover Winery and gorgeous scenery. Located just west of Middletown, Madison Township is a great place for a day on the green. Home to two beautiful golf courses and its largest attraction, Land of Illusion Haunted Scream Park. This rural haven is the perfect place to decompress and reconnect with the outdoors. With beautiful parks, scenic drives and an agricultural feel, Reily Township offers travelers a retreat into a peaceful setting. Family traditions, fresh air, and amazing fall festivals can be found in Ross Township. Make everlasting memories at the Burwinkel Farms Fall Festival. Hayride like a true autumn adventurer through a dreamy field of sunflowers and pick a pumpkin to take home.